Positano is a small town of about 3860 inhabitants is situated in Campania, in the province of Salerno. It is located in the heart of the Amalfi Coast and it is called “the pearl of Italy”, nestled as it is in a corner of paradise between steep cliffs and gentle waves. The origins of Positano are very ancient and it is thought to have been founded by a group of exiles from the nearby Paestum. The Lattari Mountains protect the town from the northern winds, which is why it enjoys a mild and dry climate. Positano has a peculiar and original structure with buildings climbing along the cliff. 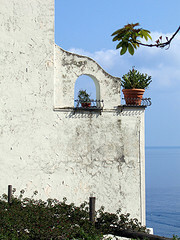 Its houses, next to each other, so much photographed, are the characteristic of Positano. Once you get there, it is difficult to stop looking around. The eye is caught by the bright colours all around: white houses decorated with lots of colourful flowers, small artisan shops with colourful textiles. Not to forget the smell of handmade leather sandals and of the restaurants specializing in seafood cuisine. Arriving there, you can see lemon and orange trees, flowers, olive groves and gardens reaching down to the sea. 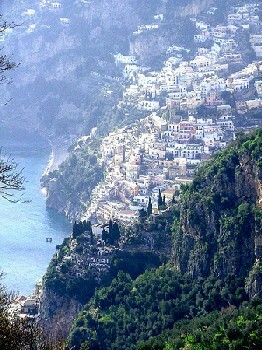 Positano is all pedestrian and there is a service of porters from the pedestrian zone that delivers luggage to hotels. Cars can be left in the car park in Piazza dei Mulini. This precious town, also known as “the town of the Scalinatelle” (small stairs going up and down) is really charming and attractive, with thousands of unique and exclusive corners. From a historical and archaeological point of view, visitors can see the Roman Villa with its beautiful defensive towers, and the Cathedral of Santa Maria Assunta, with a massive majolica dome, visible from any point in the town. Positano offers visitors a rich treasure from the natural point of view: landscapes everywhere, the Marina Grande beach and the small beaches of Fornillo and Ports di Arienzo. Positano is in itself a work of art, a joy for eyes and heart.